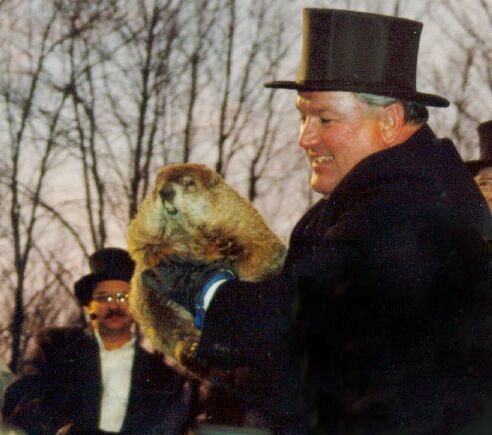 This year, both Groundhog Day and the State of the Union Address fall on the same day. As Air America Radio pointed out, "It is an ironic juxtaposition: one involves a meaningless ritual in which we look to a creature of little intelligence for prognostication, and the other involves a groundhog". http://www.groundhog.org/info/feb1.shtml check out some of these events!! which one do you want to attend? i personally want to go to Groundhog Bingo.. who's coming with me? in other news the weekend was pretty lame. (lame sauce, say it with me) i did my first run; it was a little rougher than anticipated! we ate out too much and spent too much monies per usual. Awww... dang! I'm going to have a hard time picking between the magician and the scavenger hunt! They're at the same time!! What's a girl to do?? um okay how about a boo for the democratic response... we're on a roll!